Brenda Riley Smith, Nu, was our Woman of the Year Honoree for 2015. Brenda is a charter member of our alumnae chapter, was president for many years and was our PH representative for several years. She is a Golden Violet. 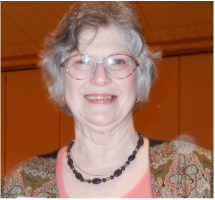 Dr. Barbara Smith Thompson, Nu, was Tri Sigma's Woman of the Year for 2014. Vicki Wellman Bird (center), Nu, GKCPH Scholarship Committee, introduces the six of thirteen scholarship winners who were present. Leanna Meredith (2nd from right), Nu at UCM, is one of the scholarship winners. Vicki Wellman Bird, Nu, was Tri Sigma's Woman of the Year for 2013. Lindsey Grindel, Nu at UCM, and Sarah Trosen, Mu at Truman and daughter of Rhonda Trosen, Mu, were scholarship winners. Carol Crank Phillips, Nu, receiving her award as Tri Sigma's Woman of the Year. 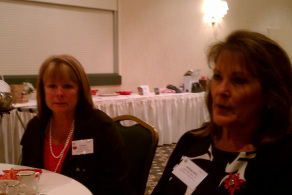 Ellen Williams Johnson's, Beta Beta, daughter received one of the scholarships given by GKC panhellenic.